I know what you might be thinking. 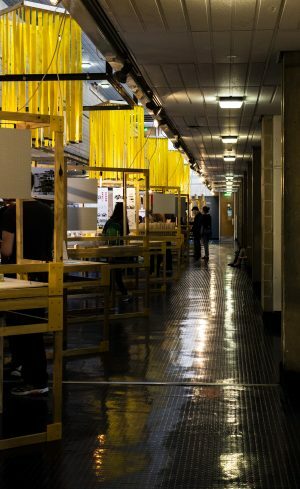 Of all the departments in DJCAD, Interior and Environmental Design is typically the one that raises the question of its discipline, “…What is that?”. A wander around the students’ work at this year’s Degree Show will certainly clarify that for you. With concepts ranging from an installation that recaptures childhood wonder to a rehabilitation centre based on snakes and ladders, the work on display will dispel the common belief that the discipline characterises surface-deep decoration, instead revealing layers of work that occupy the space between design, architecture and art with pride. Each year, the students are responsible for designing and curating their exhibition space. Unusually, the walls of the Floor 5 corridor have been left bare. Instead, the centre of the corridor has been filled with timber frame structures that offer horizontal and vertical display areas, which have been gathered into groups of three throughout the space. Drawing attention to each individual grouping are long strips of yellow fabric which hang from six suspended timber squares, like beams of light within the neutral-grey painted corridor. A Moment of Play by Cathrynn Healy creates a dramatic introduction to the space, unique for being the only installation. 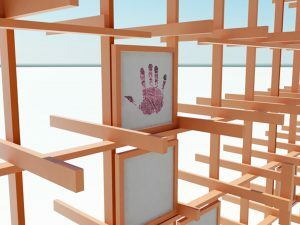 Constructed from intersecting horizontal and vertical timber grids, a 3D labyrinth is created with irregular openings in the frames allowing the visitor to travel through and experience the installation from within. Interspersed throughout the grids are squares of thermochromic pigment which change colour when touched, encouraging interaction and play. Investigating users’ train journeys in Scotland, and how they could be improved, led Rachel Goodwin to design REtrain – a design consisting of themed carriages that enhance the train travel experience and allow journeys to be perceived as a continuation of daily life, as opposed to an under-stimulating, uncomfortable and disruptive experience. Her final design comprises three different carriages: Work, Leisure and Relax and is visualised predominantly by an impressive model, designed like a wheel in order to fit all the train carriages, which can be interacted with by turning a handle (gently!). Katarina Spenerova has created PETAL, an adaptable modular community building system that enables inhabitants to take charge of their living situation, whether urban or rural, by allowing them to form and alter their dwelling organically. Spenerova drew inspiration from the organic life cycle – how both plants and humans grow and adapt to change throughout their lifespan – to develop PETAL. The growing number of people living alone can be integrated within a community, and the elderly are able to remain in their homes for longer due to the building system’s flexibility. 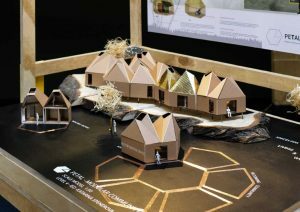 The final design is memorable for its blooming-flower configuration of modules with pitched roofs, reminiscent of flowers straining towards the sun, elegantly illustrated by a model of gold, copper and cardboard. What stands out from the Interior and Environmental Design display is the background work that has gone into each of the eighteen students’ projects to create their final outcome; the sketches and diagrams that show every stage of their personal process are presented here. Often the most insightful to view, perhaps even the most memorable.